The DONATE Button is Now Open! Thank you to all those who visit the site. It's a real thrill to know how many daily visits I get and that Permaculture is gaining more and more awareness and enthusiasm. Just like it was once a big part of our past, it will be without a doubt an integral part of our future. 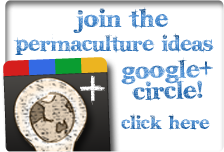 Permaculture needs more attention! It's one of those things that just makes perfect sense. This project isn't my livelihood, but I'd love it to be, or at least allow my family to feel great that it's taking my time away from them for a sustainable reason! The Donate button is open, so feel free to show your appreciation of the ideas I find and share. Thanks. More GREAT ideas to come. Stay tuned! 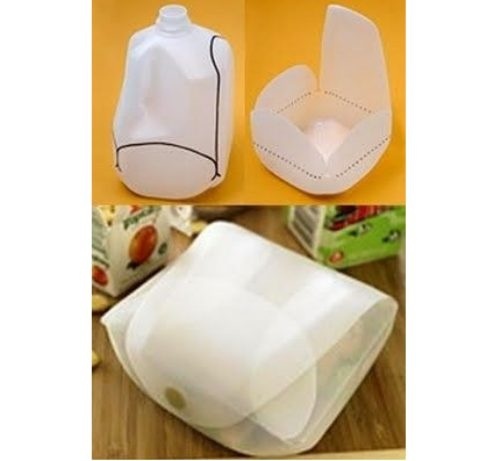 Lunch box, storage container, sewing kit, ETC.!!! That little pop-stud is available from loads of places. This is a very simple video - no talking, no instructions, etc. - but I was compelled to put it up here because it really demonstrates to those who are unfamiliar with the tilling and toiling action of pigs. Left alone in an area, you get a great a idea of how pigs can do a hog-load of work for you - and be completely happy to do so! Caged tomatoes are widely grown but you can grow strong healthy insanely productive plants with no cages. Here's how it's done. Simple to make. Reduces landfill. Uses YOUR energy as opposed to that of the recycling plant. Innovative. 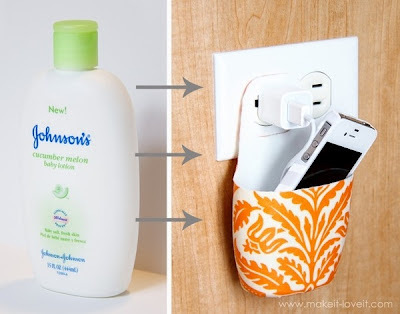 Make a thoughtful observation of the things in your home and put them to good use. That's Permaculture. 1. Make four small holes in a plastic bottle. Don't forget to make them perpendicular to each other. 2. Feed through the wooden spoons. 3. Slightly enlarge the holes that open up to the "bowl" end of the spoons so the seeds "feed" out. 4. 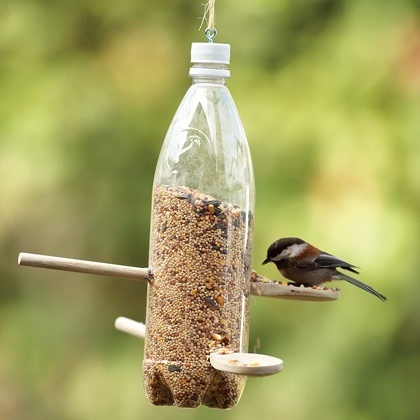 Fill bottle with bird seed. 5. Hang above a container to collect bird poo. 6. Use bird poo in compost or as a fertiliser. Bird poo is rich in nitrogen and phosphate, essential ingredients for leaf and stem growth. The classic Permaculture Spiral, and a very nicely designed and looked-after Herb Spiral at that, displaying multiple micro climates. "Popping" as our narrator puts it! The first honor system farm stand is at Inspiration Farm in Bellingham, Washington. Brian Kerkvliet gives us the tour. He's selling plant starts in the spring and the full array of produce as everything comes on. He says that the stand next to the road is, at the very least, generating curiosity. People are stopping just to check it out. He talks about the idea of potting up plants that he finds on his property that he doesn't want like stinging nettles or black locust trees. Brian says that he hasn't had any problems with vandalism or theft. Next I visit with Karen Biondo of la Biondo Farm and Kitchen on Vashon Island, Washington. She says that she used to keep all the money stuff in an open tackle box so people could make change. Twice in one year the money was stolen, but that still works out to be not a big deal. A neighbor made her an industrial strength cash box which has eliminated the theft problem. She has something called "pay it forward farm bucks" as an alternative to making change. She has garbage cans for keeping potatoes. I like the free basket. I think it would be neat to have a free shed where people can drop off free stuff and pick up free stuff. Maybe ask folks to put a buck in to haul off old free stuff. The final stop is at Langley Fine Gardens. Little Jamie has been peristant throughout the day about feeding tennis balls to the chicken. Jamie's mom, Anna Olive has been awesome at taking me around vashon island to see lots of cool things. The bottom line is that the tennis balls with the chicken is a brilliant way to build business - especially with any family with little kids that have seen the tennis ball chicken. Jamie puts the tennis ball in and we follow where it goes. Langley has lots of plants starts available when we stop by. Leda Menser-Langley tells me about how they used to have a money box, but had some tiny theft. And then came up with the chicken thing due to concerns about possible future theft. So customers put the money in the tennis ball and then send it down the tube. Leda explains that she feels discomfort at farm stands with messages like "please don't steal from us" - as if they are accusing her of being the thief.